We care about our neighborhood! We want to do some good and help people eat better here, in the South Bronx. After reading the scary article about the Bronx Obesity-Hunger Paradox, we decided to take action. 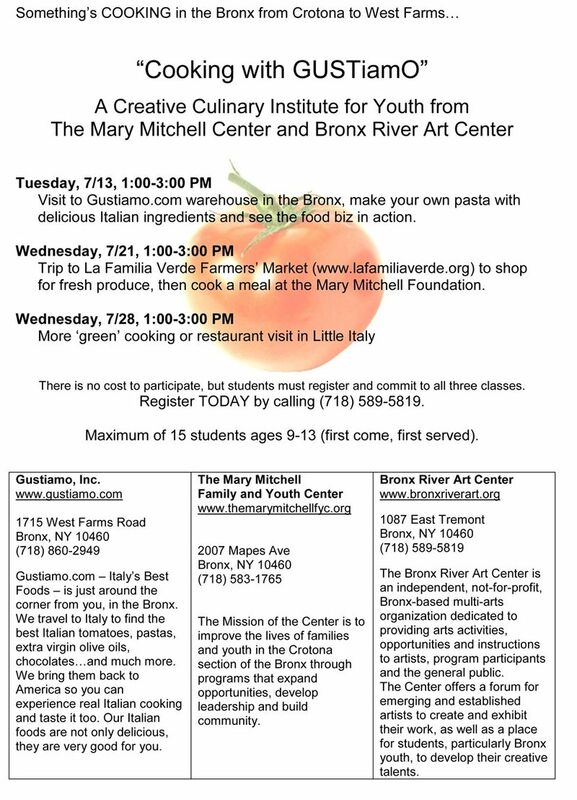 With Gail of the Bronx River Art Center, and with Heidi of the Mary Mitchell Community Center, Gustiamo is sponsoring a three day program where kids will play with and learn about good ingredients and where they come from, shop at the local farmer’s market and make pizza in a real pizzeria on Arthur Avenue. Flier is on the left, here. The first day of the program, next Tuesday, will be at Gustiamo: 10 kids will come to the warehouse and will prepare their own pasta (farfalle!) with olive oil, fresh and canned tomatoes, zucchine and herbs. It will be a revelation for them! What fun!!! Their parents will come along and enjoy the free lunch, too! Will we change something? Will the kids like it? We surely hope so!!! Previous Post The Obesity-Hunger Paradox. In The South Bronx the Highest Rate. Next Post Why the DOP Saffron Navelli Is the Best of the World and Why It Is So Expensive. This is GREAT!! Thank you Gustiamo for caring about children. Your goodwill is inspiring me to think of a way that I can make a difference in my own community! What an absolutely wonderful idea!